For meetings, conferences and concerts, with the ME-30W Conference Microphones, it is easier than ever to capture sounds in large gatherings, all in high quality stereo. This professional solution includes two omni-directional microphones engineered by Olympus for seamless compatibility. With 360°coverage, you'll never miss a contribution - no matter where the speaker is sitting. 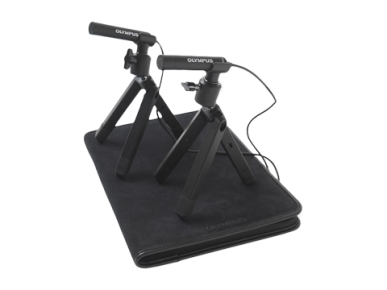 These left and right channel, low-noise stereo microphones cover a 20Hz - 20,000Hz frequency bandwidth and can be attached to two foldable mini tripods which are included in the kit. For maximum coverage, they can be placed up to 5 metres (16ft) apart – perfect for recording in large rooms, concert venues or when many participants are sitting around a very large table. 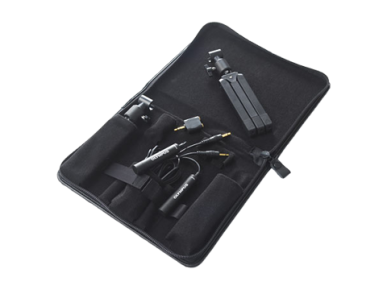 The ME-30W Conference Microphone Kit includes a soft carry case that keeps everything together, compact and protected on the move. Optionally the Conference Microphone Kit can be equipped with an AC power adaptor, for potentially unlimited power. Two Channel Versatility: The right and left channel microphones may be placed up to 16 feet apart, suitable for conference recording in large rooms. Excellent Sound Quality: Employs a low noise, high-quality microphone element covering a 20 Hz - 20,000 Hz frequency response, and can therefore be used for recording musical performances as well as conferences. Two Microphones: Can be attached to the foldable mini tripod (TR1) stand adapters and placed across a large conference table. No Extra Batteries: The plug-in power system means you don't have to worry about needing extra microphone batteries.